Dental problems are an unfortunate part of life, but they’re something a lot of people have to deal with. It’s estimated that 7 out 10 Canadians will develop gum disease alone. Seeing the dentist is pretty routine, but going through dental procedures is a bit different. Going to the dentist for a root canal, crown, or other procedure can be stressful if you aren’t properly prepared. Your dentist is probably going to have pre-surgery care rules you have to follow, but if you want to truly prepare for your upcoming procedure you should go beyond their instructions. Want to have a smooth procedure and do pre-surgery prep the right way? If you follow these tips, surgery day will be a breeze. Your dentist just gave you a list of pre-surgery care tips they want you to follow. If you want to have the best experience possible on the day of your surgery, don’t leave the dentist’s office before you’re clear on everything. Don’t skim the document and try to call them back later. Read through everything and ask questions while the information is still fresh in your mind. Do you have questions about what you can eat after the procedure? Are you able to go back to work the day afterward? Regardless of what your question is, be sure to ask to make sure everyone is on the same page. Some dental procedures will require some form of sedation. If you’re getting sedated for the procedure you’ll need a way to get home safely after. You shouldn’t attempt to drive yourself home after a procedure, even if you feel “fine.” Operating a vehicle under the influence of sedatives is dangerous and shouldn’t be done. It’s also important to point out that taking public transit or using a ride sharing service isn’t ideal. You may not be feeling coherent after your surgery, and you’ll need someone that you can trust to help you get home. As a friend or family member if they can make sure you get to and from the procedure safely. If you can’t secure a ride, ask your dentist before hand if you can stay in the office for a few hours while you recover. You’re going to want to be as comfortable as possible when you go in for your procedure. Being in comfortable and familiar clothes can also help lessen anxiety and help you feel more at ease during the surgery. Sweatpants and a short sleeved shirt would be the perfect outfit for people going through dental procedures. Short sleeves (or sleeves that can easily be rolled up) can make it easier for nurses to check your vitals or access veins for an IV. Sweatpants are comfortable and easy to move in. You won’t be moving around much during your procedure, but you’ll still appreciate wearing soft pants if you have to be immobile for awhile. Do you wear a retainer or removable bridgework? Do you wear dentures or partial plates? You won’t be able to wear them during the procedure, and you’ll want to make sure that they’re stored in a safe place. Bring a small box to keep your belongings in. It’ll make sure that they’re easy to locate after the procedure is done, and can help keep them clean. Most dental procedures will require some form of numbing or sedation. 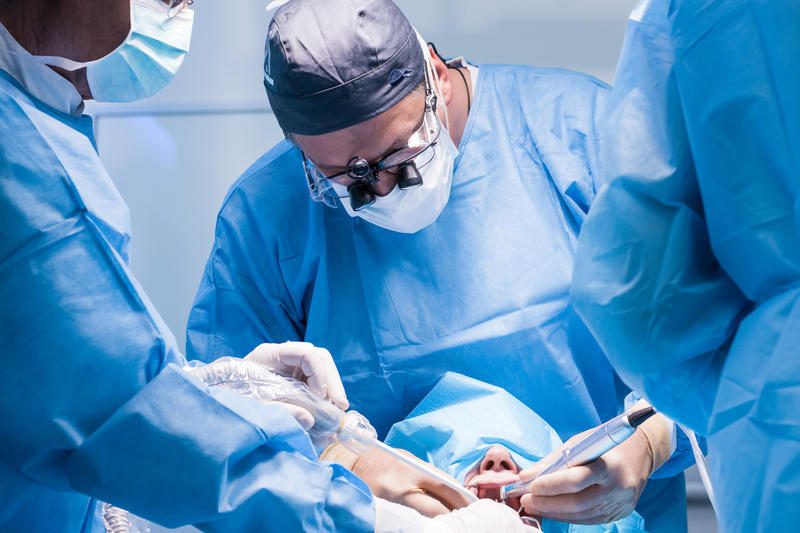 If you’re going to need anesthetic you should avoid food and drinks at least 12 hours before your procedure. Some anesthetics can cause nausea and vomiting. You don’t want to have an upset stomach after the procedure is done, or possibly vomit during it. Be sure to ask your dentist if you need to fast before the surgery, and how long you need to do it for. If they do say that you can eat, try to eat light and avoid fatty or fried foods. Be sure to let your dentist know about any medication you take, and whether or not it’s safe to take the day of the procedure. Some of the anesthetics or antibiotics may interact with what you take. Mention everything you take daily to your doctor, even over the counter things like aspirin, vitamins, or sleep supplements. Don’t leave anything out even if it seems small. Knowing what to expect after dental procedures are over are an important part of preparing for them. It isn’t uncommon to have to take medicine, use oral rinses, or avoid certain foods after a dental procedure. Ask your dentist about what your recovery will look like. Ask them if they have recommendations for food and drinks, and how long you should expect to have to stay home from work or school. It isn’t uncommon for some people to experience anxiety before they get dental procedures. It’s estimated that 9%-15% of people avoid the dentist altogether because of fear. You aren’t worried about being ready for the surgery, but you do have a lot of worry about the procedure itself. There are some simple things you can do to overcome your dental anxiety so you can go into the procedure calm. Dentists are used to dealing with patients with anxiety. Being honest about your feelings can let your dentist help you become comfortable with the procedure. They could have special things they do to cater to patients with dental anxiety. Do you have a certain song that always gets you into a good mood? Is there a playlist you use when you need to relax? Try using some of your favorite music to calm down before the procedure. Sometimes having a friend by your side can make things more bearable. Most doctors won’t mind having a friend or loved one in the waiting room if it’ll help their patients stay calm. With the right prep work, getting dental procedures done is simple. As long as you follow your dentist’s directions and take care of yourself, you’ll be fine. If you want to learn more about dental hygiene, feel free to contact us so we can talk. Are Electric Toothbrushes Better Than Traditional Ones?